This graph shows the correlation between longest streak on the vertical axis and total gain on the horizontal axis. I think that I would like to have on here some kind of "sticky" posting or maybe some permanent form... about basic principles of gambling. I just might create a new topic in the General forum and post my top ten... but for now let me talk about this one. 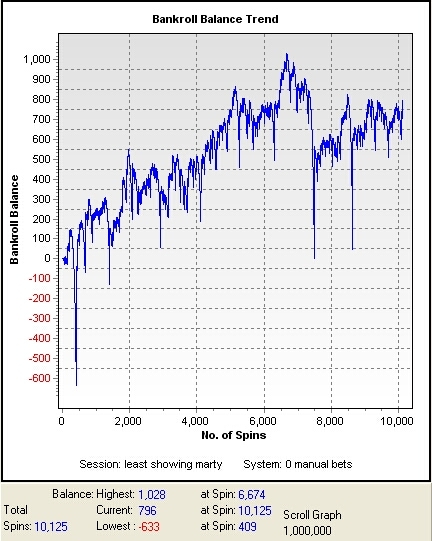 To best explain why a system which bets that any particular streak of even bets will end is not any better bet than just betting player or banker (approximately 50/50 chance) the following illustration is useful. In fact, from the illustration I will give you will be able to ascertain another adage from my top ten truism list (I'll mention that later). If it makes sense to bet that a streak of six or a streak of four will end (I have seen those two concepts posited recently) then it would make sense to bet that any and all streaks will end. Because, here is a absolute fact... All streaks will end if you continue to play into the next shoe in Baccarat or another spin of the wheel in Roulette. First principle --- All streaks end. This means that if you bet that they will ... they will eventually and you can calculate your wins and losses without even playing from the data from any shoe history as I will illustrate. First, you need to stop thinking of even bets in terms of Player/Banker or red/black even/odd etc. Instead... record your play (the way they do it in the 72 hours book) as streaks. Now, notice that all streaks end with a 1 entry on the chart. In fact, I would be willing to bet you than I can walk into any casino at any time and that I will bet and win on every single occurence of all the 1's with the exception of the first one as I start play (and I have a 50/50 chance of getting that one right or no betting it and not losing even that one). To do that I just bet every time that the streak I am seeing is going to end on the very next hand or spin. Notice that in the example I gave... if I no bet the hand and then bet that all streaks will end on the next hand I win 4 times and I lose 3 times... hey, what a system, huh? After the first hand shows, we bet that every streak (no matter the length) will end on the next hand, so we bet the opposite. Since, every streak has a 1 to begin it (and that coincidently ends the streak which precedes it) we will successfully bet every occurence of a 1 (except the first which we no-bet). We will have 40 winners we had 42 1's but we no-bet the first and the last streak ends on a 2 so unless we play into the next shoe we will just have to accept not finding the end of that streak. 70 bets and 40 winners (30 losers) means we end up +10 units for that shoe. This is starting to look like a system you might want to purchase if someone had been telling you these examples... good thing its free, huh? Well... like so many bet selections those results while true... are not representative of what will happen over time. Lets just calculate the results as though we played the entire 600 shoes all the way through from shoe to shoe without stopping. hands 41001 (subtracted first as no bet) so 20,407 loses. Net wins +186 (with normal deviations... this would be considered breakeven). Conclusion.... all streaks end.. and they end equally.